Mats Zuccarello went from being owned in 28% of Yahoo leagues last week to 42%. Paul Stastny is still available in 73% of Yahoo leagues, while Bryan Little can be had in 82% of Yahoo leagues. Derick Brassard, who has been playing in Florida’s top-six forward group as a winger, has one goal and two assists in four games. He is owned in only 5% of Yahoo leagues. Hyman has heated up with eight points in the past nine matches. He also has two goals and four helpers during a four-game point streak. Hyman has skated alongside Mitch Marner and John Tavares for the majority of the 2018-19 season, but his workmanlike play has not always translated into points. He has been hot lately, though, which makes him worthy of a flier if he is available. Toffoli has generated nine points, including six assists, in the last nine contests. He has been held off the scoresheet on just two occasions during that span. Toffoli has also collected three goals and three assists over a four-game point streak. He has been clicking offensively with the trade deadline drawing near and his name has surfaced in plenty of rumors. Jenner has picked up one goal and three helpers in two games since returning to the lineup from a lacerated ankle, which became infected. He has also been credited with 10 hits and four shots during that span. Jenner has been centering the second line of the Blue Jackets between Nick Foligno and Josh Anderson. He has surpassed 200 hits in each of the past three seasons and in 2018-19 he has 107 through 51 contests. 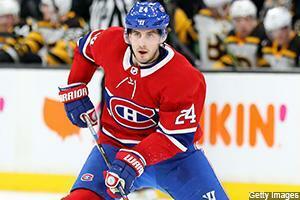 Danault has accounted for four goals and nine assists in the past 13 games. He had his four-game point streak snapped on Saturday, but Danault has meshed nicely between Brendan Gallagher and Jonathan Drouin, who has heated up offensively lately. He has already equaled his previous personal high for points in a season and is just two goals from matching his career best. Smith has two goals and one assist during a three-game point streak on the heels of a 10-game pointless slump. He has piled up points in bunches this season, which should make him worthy of a flier for this week. The Predators' return to full strength up front will help him out as well. McElhinney appeared on Waiver Wired last week and he’s worth mentioning again. He did allow five goals to Buffalo this past Thursday, but he still got the victory after he blanked Pittsburgh earlier in the week. McElhinney, who has 20 wins on the year, has a 6-1-0 record in his past seven appearances. He also owns a 2.50 goals-against average and .915 save percentage. Carolina plays at Ottawa before hosting Edmonton and Dallas this coming week. Strome continues to fly under the radar in the majority of Yahoo leagues. He has amassed 13 points, including 10 assists, in his past eight games. Strome has five multi-point performances during that stretch. He is up to 10 goals and 27 points in 31 matches as a member of the Blackhawks. Strome has rekindled the chemistry he had with Alex DeBrincat when the talented duo played together for the Erie Otters of the OHL. Labanc has caught fire with fives goals and seven assists in the last 11 outings. He tallied a hat trick on Saturday night versus Edmonton and has been scoring points at a higher rate this season. Labanc has been playing mostly on the third line with Joe Thornton, but he has been seeing time on the top power-play unit as well, which gives him exposure to Logan Couture, Joe Pavelski and Tomas Hertl. Vanek has produced four goals and six assists in the last nine matches. He has registered two four-game point sprees during that stretch. Vanek, who typically gets mentioned around trade-deadline time, should attract some attention of fantasy GMs in deeper leagues. Heinen went from struggling to produce to being a healthy scratch to playing on the top line of the Bruins. He has been successful alongside Patrice Bergeron and Brad Marchand for the last two games with two goals and one assist. David Pastrnak could eventually return to the first combination, but Heinen has plenty of short-term value at the very least.